"And the people all said 'Sit down..."
Sit down, you’re rocking the boat. There’s as many ways this 2009 Auburn team is different from the 2008 team as there are stars in the sky, fish in the sea, shots downed this weekend by Georgia fans, etc. But we all know that one of–if not the–most significant one was how united Gene Chizik and the Auburn players had seemed to become. Instead of the back-biting and boos over the QB situation, we had Kodi’s speech. Instead of Tubby’s occasional aloofness and the general lack of emotion of any kind on the sideline, we’ve got Trooper’s festival of jump-bumps and Chizik slapping every defender’s shoulder he can get a hand on after a 3-and-out. And while Kodi’s speech was a watershed moment, the building of this team started in the offseason, when Gene Chizik met (separately) with Eltoro Freeman and Antonio Coleman and convinced both of them that they needed to be a part of this 2009 season. So it’s more than a little disappointing that even with Auburn at 5-1 overall and 2-1 in the SEC, those two players have become the first two small fissures in the team’s unified foundation. Freeman, you’ll recall, was benched for Adam Herring during the Tennessee game and didn’t seem to take it well; this weekend he did not travel with the team after what Chizik termed “personal issues” and did not practice Sunday. Obviously we’re going to have to wait for more facts to know exactly what’s going on (if we ever will) or what’s going to happen next for The Toro, but it’s awfully hard to look at this chain of events and not think “personal issues” is code for “deeply unhappy about his playing time,” isn’t it? Here’s to hoping it’s something completely different, but in either case, unless freeman returns Auburn is down to–count ’em–four healthy scholarship linebackers. (More in a Jay G. Tate story here and a blog post here.) Maybe it’s just me, but is there some other way to read phrases like “what’s going on” or “a couple of things that I may see we need to work on” other than What the coaches and my teammates are doing isn’t working? Coleman sacrificed a ton to play for Auburn this season, and he has every right to feel hurt that his defense is giving up yards left and right and, occasionally, points by the bushelful. He’s playing hurt–which doesn’t help matters–and if he wants to talk to Chizik about his role and his frustration, fine by me. But why tell the press? There’s nothing positive that comes from random Auburn fan jerk-offs like me knowing you’re unhappy, and there’s probably even less good to come from teammates who are toeing the line and being ever-so-subtly called out. I’m not worried about his response to Auburn’s play on the field–this is a good week for Kentucky to come in, or it had better be, anyway–but sealing these fissures looks to me like the first real challenge of Gene Chizik’s Auburn tenure. 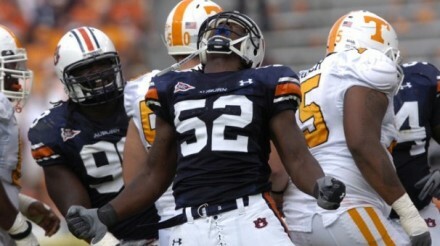 — Chizik doesn’t think Walt McFadden’s injury “is anything catastrophic,” and for Chizik that’s pretty revealing. It might be nice to rest McFadden Saturday if we can, but I bet he’ll play. — Malzahn sounded a midweek warning sign that Auburn’s practices hadn’t been as focused as they had before, and now Todd echoes that sentiment. Guess we’ll have to pay a little better attention to that little canary in the coal mine from now on. More on that here. That they do, Lee, that they do. Good to know that Roof is at least thinking about being more aggressive, because to this point his arrival hasn’t quite had the same kind of impact on our rush defense and pass rush–even adjusting for playing opposite Malzahn and the lack of depth–I’d hoped for. — Not that it’s a surprise to anyone, but Auburn dropped out of the mainstream polls. Auburn does still rank 24th in the Harris. They have been replaced by, amongst other teams, a Utah team with one fewer win and victories over mighty Utah St., San Jose St., Louisville, and Colorado St., and Missouri, who just lost by 16 points at home, also has one fewer win, and has beaten Illinois, Furman, Bowling Green, and Nevada. We only bring it up because we know you can do better, and because we care. You’ve got the potential to be recognized as one of the best Auburn bloggers out there. Just give it a read-through next time. P.S. We would have just emailed you privately, but alas, we can find no way of doing that on this website. You’re welcome to delete this comment. At least he has stopped splitting infinitives. Thanks, now I can tell my inner editor to simmer down and go back to grumbling about how no one would listen when I said narrative style news reporting was just a fad. Didn’t know if the email changed with your move to TWER. Comma splice?!? Can’t stand ’em myself–I much prefer colons and dashes to link my thoughts together–but anyone who’s that bothered by one had best not visit England, where from what I understand they’re perfectly correct grammar. I apologize for being crass earlier today. Sw-al, I genuinely couldn’t care less. For starters, I’m well aware that some (ok, many) of my sentences run long, especially by CFB blog standards. I like to think I keep them all readable, but it’s not like it surprises me when one, well, isn’t. Second: after some of the comments I got last week, having just my self-editing called into question is kind of a refreshing change of pace.